I actually wasn’t planning on going to Bersih 3.0 yesterday. It was a very late decision made after realising I would be a horrendously big hypocrite for talking about the need for clean and fair elections without actually going for such a rally. Plus, unlike last year, I had no family obligations planned for today. My father gave me his full support and helped me hunt down the salt packets we have extras at home to take to the rally. He told me he would be there later cause he needed to pick mom up from work first. So I packed a bag filled with salt, water and a notebook and pen (just in case) and drove down to the LRT station. I met my uncle on the way there, which was a surprise because I didn’t think he was a registered voter but the more the merrier, right? :D We split up while he went to get a ticket and I went to grab some buns and water for breakfast. While we were on the train, we passed by overhead some of the roads that led to KL. There were cheers in the train because we also saw people on foot making their ways from Brickfields to KL (I missed the opportunity to snap a pic as I was too slow in taking the cam out), many wearing the Bersih t-shirt. I left the train after that at Central Market to meet with some friends. While leaving the station, I noticed that the station crew and a lone policeman was helping direct traffic; one side of the stairs was cordoned off for those coming up the platform, and the other for those leaving the platform. It worked well. Then at the station, I passed by this shop that said “Special Offer, RM5” for… yellow t-shirts. Well, I bought it of course. Then I went down to meet up with my friends. The first thing we did was to exchange numbers of the Legal Aid department, just in case any of us were “detained”. Once that was done we began walking through KL to get to Dataran Merdeka, where we were going to join the sit-in protest. As we went through Central Market, we saw Auntie Bersih! 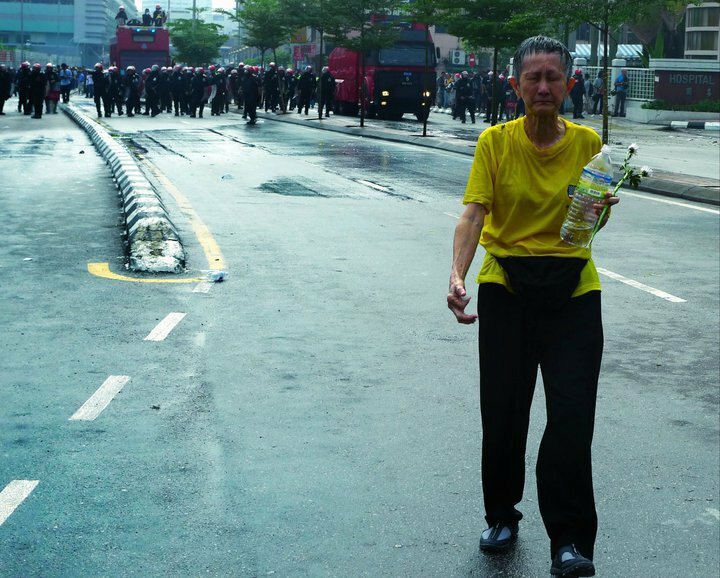 She was a sweet old lady who came peacefully to demand for clean and fair elections, and was among the many who got tear-gassed last year. Then we found that our way was barred towards Dataran Merdeka. You see, there were police there, all linking hands. It wasn’t that they were not going to let us all through. It was that they were letting only a few through at a time. So we decided to stick with the main crowds for safety’s sake and instead proceeded to walk towards Masjid Jamek. We also met a Bar Council observer on duty. You can tell they were from the Bar Council because they were the only Malaysians, I think, in full suit and tags watching people go by. This lady was kind enough to let me snap a picture of her. I count at least 100 cops on that bridge. Shortly after that we went closer and I heard people singing “Bersih, Bersih, Bersih!” to the tune of “Ole, Ole, Ole” which turned out to be something Asohan and his friends did. Yes, people were more preoccupied with getting shots of the water cannon then running. Then we turned and started walking fast. Because the teargas was coming. I thought we would be able to outrun the teargas but as it turned out the wind wasn’t in our favour. All of a sudden the teargas hit. I couldn’t breathe. I heard Swing telling me to dampen my cloth with water, and so I did. But it just got worse. People were vomiting and I did so partially too, mainly to get the water out of my throat. Then we reached a landing of sorts and both of us took some salt. It kicked in and within seconds we both felt better. Then we went down by a side staircase. At this point we saw the FRU beginning to move in, and so we moved away towards the Pasar Seni LRT. My dad messaged me at this time (he was at the other side where they got teargassed) telling me to go home cause they were teargassing people. We went looking for the boys and found them at Central Market after Ezel called us to let them know. At this point it would have been a good idea to disperse, but a Bersih medical team came up to us to ask us how to go to Masjid Jamek (they heard there were injured people there) and so we all went off to send them there. Well, not all of us. Me, Swing, Kelvin and Nerv stayed while the others went. Exo was looking for his glasses, which had fallen off while they were running. They had borne the brunt of the teargas; at one point, according to Exo, the canister landed both in front and behind them. And then I asked politely if I could take a photo of them. They just went “meh” and so I did. So after that I met up with dad and I broke up with the group early to catch a bus. We got home say to hear news of violence. :( I am a bit bitter at how things turned out (like the idiots who spoke about “Hancur BN” at what is a non-partisan rally) but also a bit hopeful, cause that spirit of spontaneity and hope? Not really something you can fabricate.